The new book, “Last Testament,” will be released in English by Bloomsbury in November. The German and Italian editions were in bookstores Sept. 9, but some excerpts were published Sept. 8 by the Italian daily newspaper Corriere della Sera. Pope Francis, on the other hand, “is a man of practical reform,” the retired pope said. His personality and experience as a Jesuit provincial and archbishop have enabled him to take practical organizational steps. Seewald also asked Pope Benedict about reports that during his pontificate there was a so-called “gay lobby” in the Curia and the group protected certain priests by threatening to blackmail others. “We dissolved it,” Pope Benedict said. 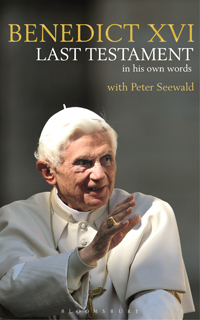 With a view to writing a biography, Seewald said he conducted his interview with Pope Benedict “shortly before and after” his resignation in February 2013. The book contains more than 500 questions and answers, covering the childhood of Joseph Ratzinger, his seminary and university years, his teaching career and his work at the Second Vatican Council. Seewald also asked about his years as a bishop in Germany, his work as prefect of the Congregation for the Doctrine of the Faith and his papacy. Pope Benedict reviewed the text and approved its publication, Seewald said. The two met May 23 at the Mater Ecclesiae monastery in the Vatican Gardens, where the retired pope lives with his secretary, Archbishop Georg Ganswein, and a small group of consecrated women, who care for the household. The only writing the retired pope does these days, he told Seewald, is a Sunday homily each week. Insisting “my hour had passed and I had given all I could,” Pope Benedict said he never has regretted resigning, but he does regret hurting friends and faithful who were “really distressed and felt forsaken” by his stepping down. As Cardinal Joseph Ratzinger, he served 24 years as prefect of the Congregation for the Doctrine of the Faith, working very closely with St. John Paul II. Despite their closeness, Pope Benedict said he easily rejected the idea of taking the name John Paul III when it became clear in the conclave of 2005 that he was about to be elected St. John Paul’s successor. 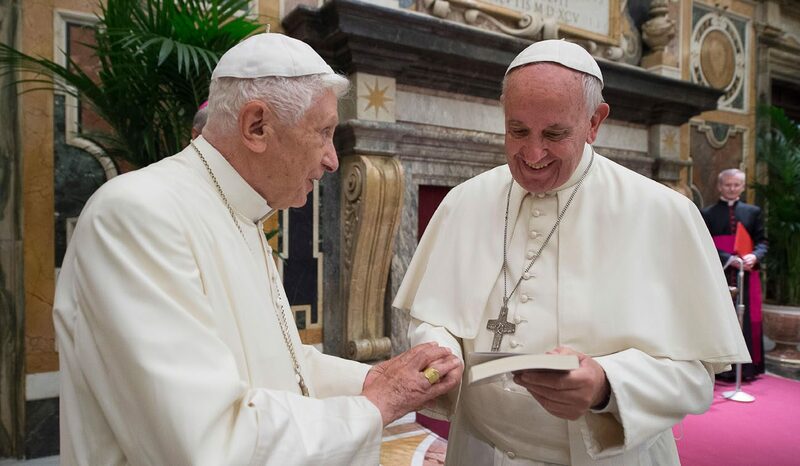 When Pope Francis published his apostolic exhortation, “Evangelii Gaudium” (“The Joy of the Gospel”) in November 2013, he sent Pope Benedict a copy bound in white, the color usually reserved for the pope’s copy of a document.